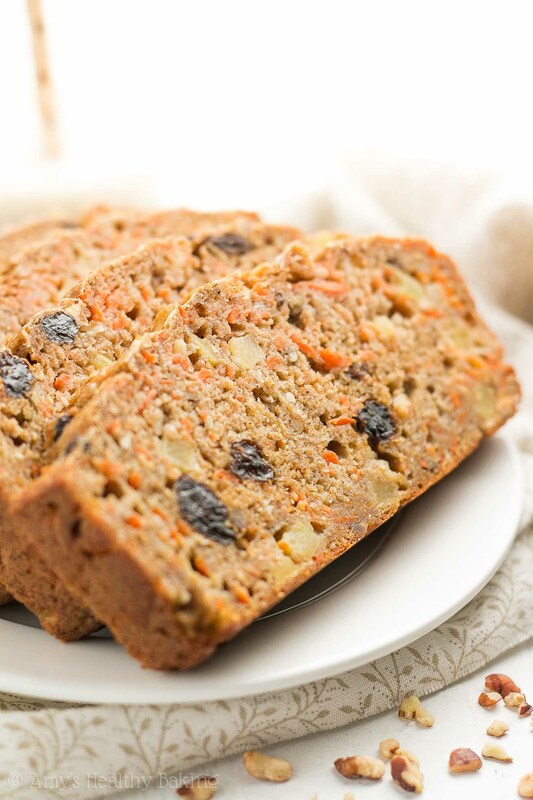 Tender banana bread that’s naturally sweetened & full of fun mix-ins! 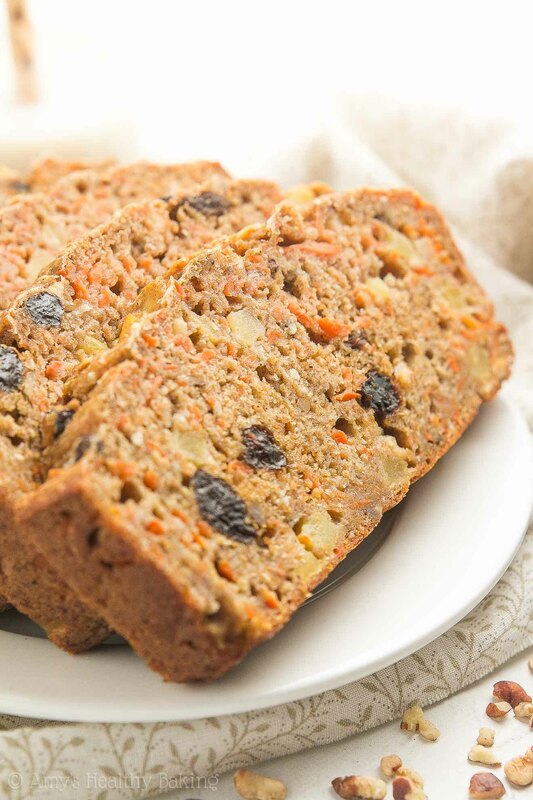 It’s really easy to make, only 135 calories & contains no refined flour or sugar! The day after Christmas, my parents and I drove from their house in the San Francisco suburbs to sunny San Diego. I set my alarm for 5 am to squeeze in a short workout, shower, pack snacks, and load my bags into the back of their SUV before we hit the road at 7 am. With a bit more traffic than we anticipated, especially in LA, we ended up taking a few detours… Plus lots of potty breaks (we brought my parents’ two golden retrievers with us! ), so we finally arrived at Grandma’s nearly 10 hours later. And for the second half of the drive, my parents’ older 85-pound dog turned slightly anxious and therefore decided he wanted to sit on my lap to calm his nerves. Oof! Because of how generous my family was with their time, I made sure to keep some of their favorite treats and refreshments on hand in my kitchen. Dark chocolate and chai for Mom, rich dark roast coffee for Dad, special egg-free lemon cookies for my brother… And lots of fresh fruit for snacking too! 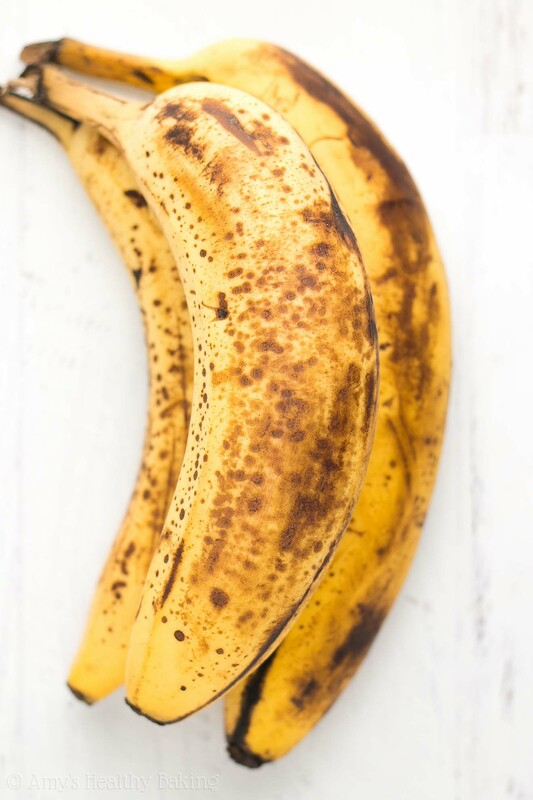 But since they also munched on Christmas cookies at Grandma’s before coming over, the fresh fruit on my counter went uneaten… And by the time they left town over New Year’s weekend, I ended up with several very brown and spotty bananas. Even better, this wholesome banana bread is so easy to make (put away your mixer—you just need regular ol’ forks and bowls!) and contains no refined flour or sugar. Plus it’s just 135 calories for a slice! Thanks to Greek yogurt and mashed banana! If you’ve been around my blog for a while, you know how much I ♡ Greek yogurt. It adds the same moisture to your batter as extra butter or oil—but for a fraction of the calories! And it gives your banana bread a protein boost, too. See those bananas? That’s the minimum amount of brown spots I recommend. I actually prefer bananas that are even riper than that! The banana actually plays multiple parts in the batter—flavor (obviously! ), tender texture, and natural sweetness—and that last role is why you want really brown bananas. The bananas with more brown color than yellow contain more natural sweetness, which means you’ll only need to add a hint of pure maple syrup (like this!). ♡ Freshly grated carrots. Don’t use store-bought pre-shredded carrots! They’re thicker and drier, and they don’t soften enough while baking. ♡ Diced apple. I use Fuji apples because they’re naturally sweet and have a great texture for baking! ♡ Raisins. Have you ever noticed that really old raisins are much stiffer and drier than freshly bought raisins? It drives me nuts! So here’s my secret trick to perfectly plump raisins… Add those old dry raisins to a bowl, and add enough water to cover them. Tightly cover the top of your bowl with plastic wrap, and microwave on HIGH for 1 minute. Let the raisins sit until you’re ready to mix them in; then drain and add them to the batter. Works like a charm! ♡ Finely diced pecans. I found these pre-diced ones at the grocery store, and they’re the perfect size! ♡ Shredded unsweetened coconut. I prefer the unsweetened variety to avoid unnecessary refined sugar… But if you only have sweetened, that works too! How incredible does that look? 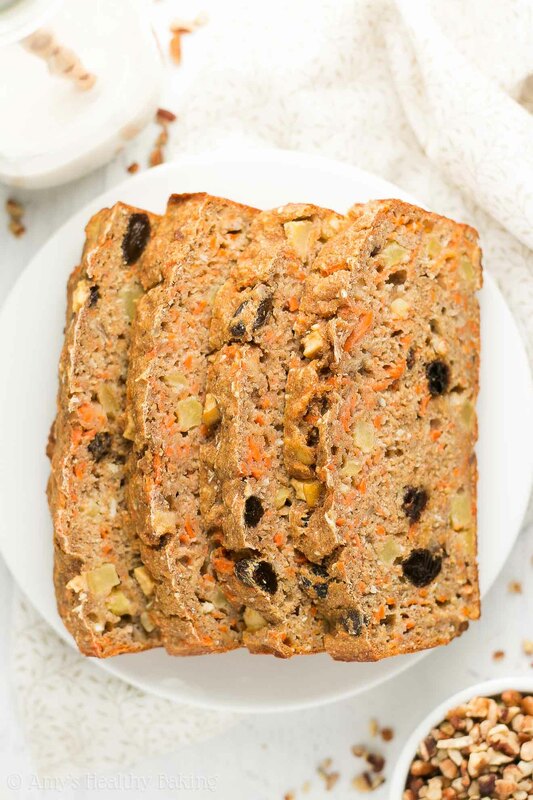 I’m secretly glad my family skipped the healthy bananas on my counter… It meant I got to make this loaf and keep it all to myself! ? And when you make your own, remember to snap a picture and share it on Instagram using #amyshealthybaking and tagging @amyshealthybaking IN the photo itself! (That guarantees I’ll see your picture! ?) I’d love to see your banana bread! 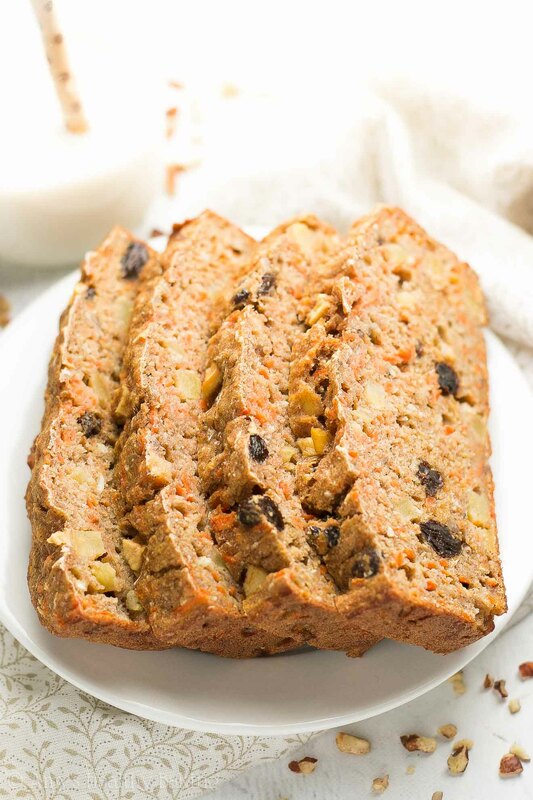 This just might be my all-time favorite banana bread! It’s really easy to make, supremely tender, naturally sweetened, and full of fun mix-ins. 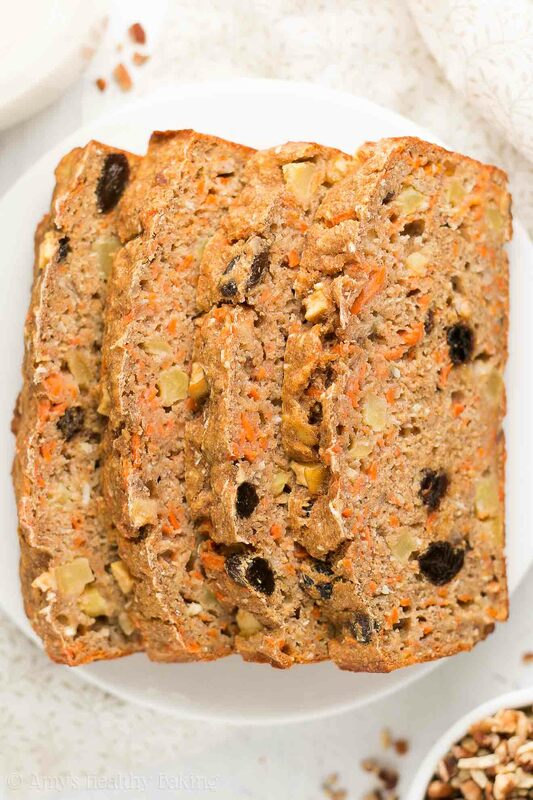 (The trio of carrots, apples, and raisins is absolutely irresistible—especially with a little cinnamon thrown in, too!) 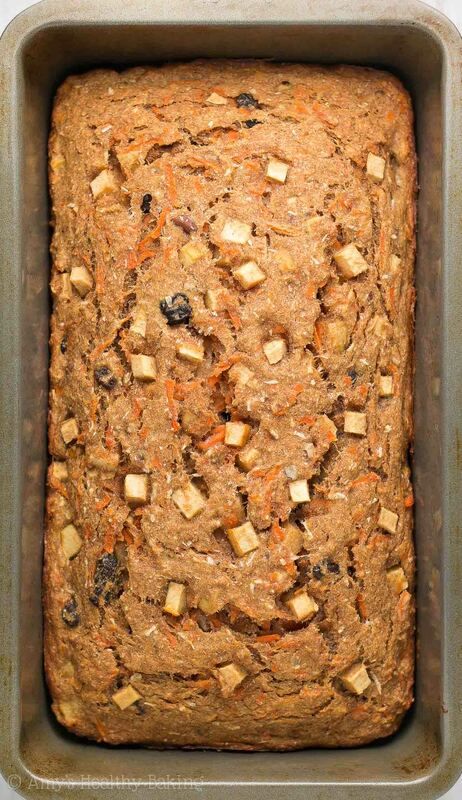 The banana bread will keep for at least one week if stored in the refrigerator in an airtight container or tightly wrapped in plastic wrap. In a medium bowl, whisk together the flour, cinnamon, baking powder, baking soda, and salt. In a separate bowl, whisk together the butter, eggs, and vanilla. Mix in the Greek yogurt, stirring until no large lumps remain. Mix in the mashed banana and maple syrup. Alternate between adding the flour mixture and milk, beginning and ending with the flour mixture, and stirring just until incorporated. (For best results, add the flour mixture in 3 equal parts.) 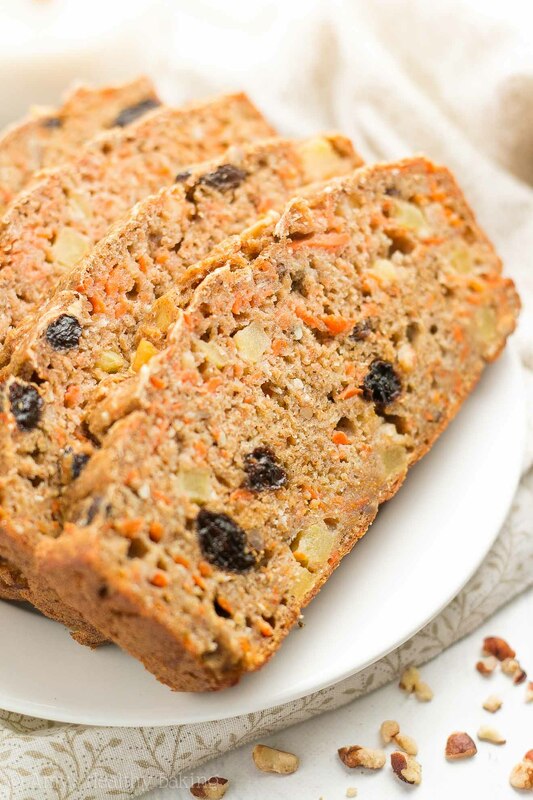 Gently fold in the carrots, apple, raisins, pecans, and coconut. Spread the batter into the prepared pan. Bake at 350°F for 45-55 minutes or until a toothpick inserted into the center comes out clean. Cool in the pan for 10 minutes before carefully transferring to a wire rack to cool completely. Notes: For the gluten-free flour, use as follows: 1 cup (120g) millet flour, ½ cup (60g) tapioca flour, ½ cup (60g) brown rice flour, and 1 ½ teaspoons xanthan gum. Many store-bought gluten-free flour blends (like this one!) will also work, if measured like this. For a shortcut, I used these pre-chopped pecans! They’re SO handy to have around! This is the shredded unsweetened coconut that I used. Shredded sweetened coconut may be substituted. To see how this banana bread is made, watch my video here (it’s for a similar banana bread recipe!). Can I use all purpose flour? Thank you! I really appreciate your interest in my recipe, Anna! I’ve actually answered this already in the Notes section, located directly underneath the Instructions. It can be easy to miss! 😉 I can’t wait to hear what you think of this banana bread! thank you so much for your reply! Can’t wait to try it using all-purpose flour! My pleasure, Anna-Marie! I’m so excited to hear how your banana bread turns out! Could I make this into muffins instead?